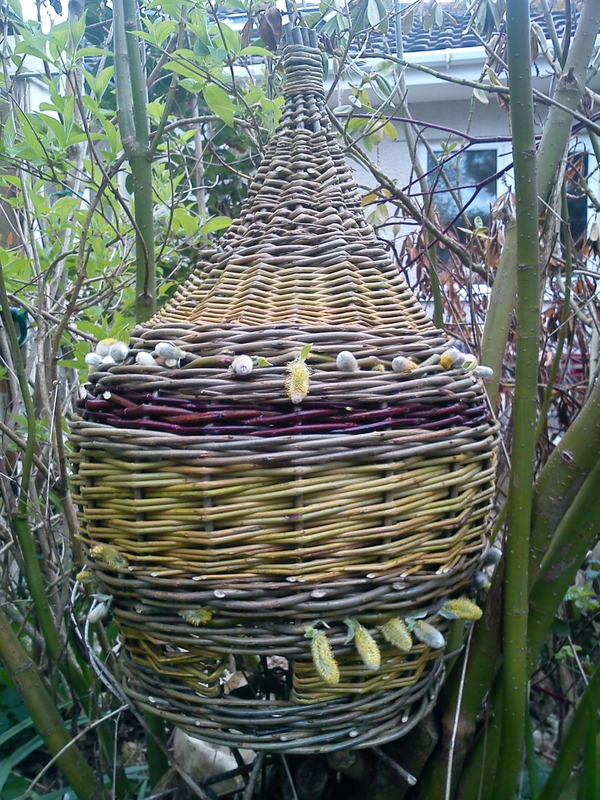 Mum already knew that she was having a bee skep for her mother’s day present – the fact that I presented her with 9 side stakes bound together with cable ties and joined with 4 rows of weaving at breakfast time didn’t suprise her – my presents are often works in progress! 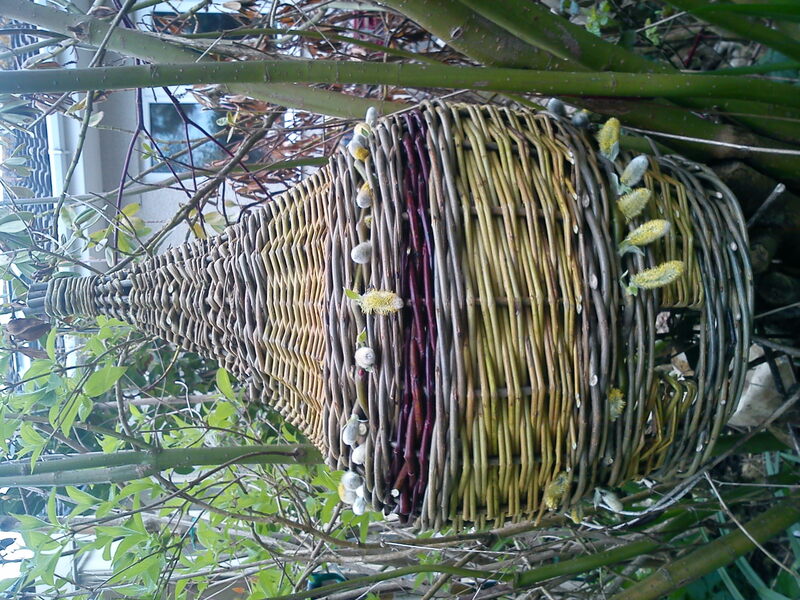 The bee skep is made from fresh and dried and soaked willow – Dicky meadows left over from a course, Black Maul, fresh Dicky Meadows and Continental Purple. 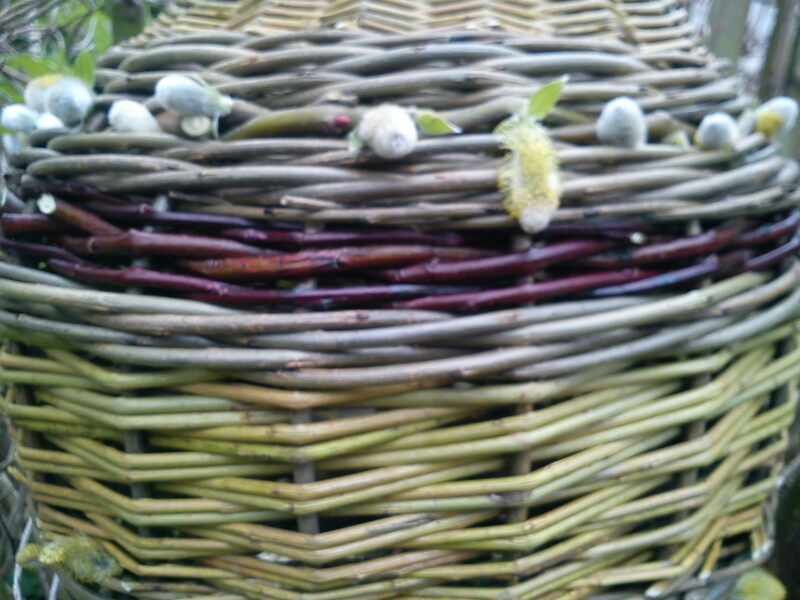 The most exciting addition was the incredible willow Candida which has fat, yellow catkins dusty with pollen which I picked at our hedgerow meeting at Pencoed last Monday – I am hoping hoping that they will stay on. I can’t use any preservative (hair spray or artist’s spray adhesive) as the skep is going to be a working one to be sited in mum’s new garden – perhaps someone knows how I can prevent them dropping off? Bee Skeps are traditional artificial bee nests. They are basically baskets used open end down and have been used for about 2000 years. Initially skeps were made from wicker plastered with mud and dung but from the middle ages they were made of straw. There is no internal structure provided for the bees and in the case of Honey bees the colony must produce its own honeycomb which is attached to the inside of the skep – with this skep we are hoping for bumblebees not honey bees so it is actually quite small. Bees are allegedly attracted to the smell of the willow – the catkins on this one should also attract them so we are hoping it will be colonised quickly. A person who made woven beehives was called a ‘Skepper’ – I am wondering if I should change my occupation on the census form before I send it off – that should confound the data checker! What a fantastic finish to the season! 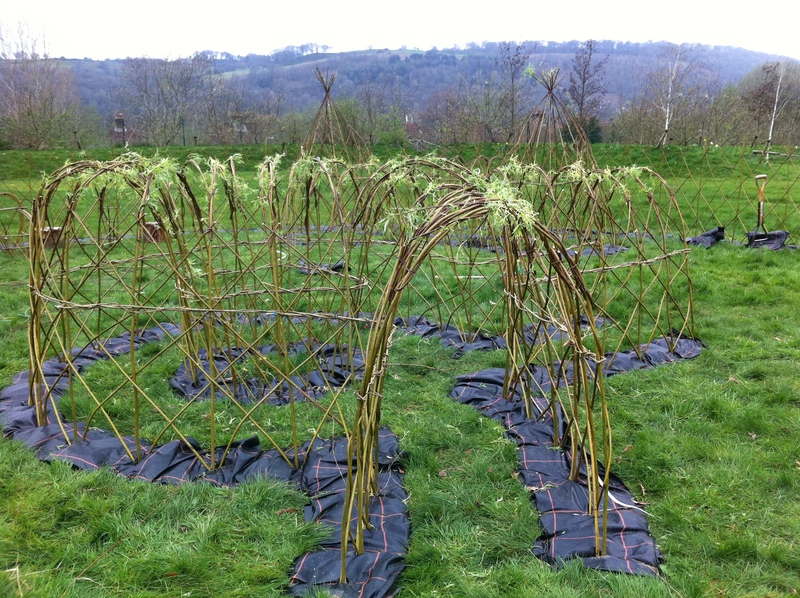 We have been working on a mini Fairytale ‘village’ of living willow structures at Rhydfelen Nursery School. 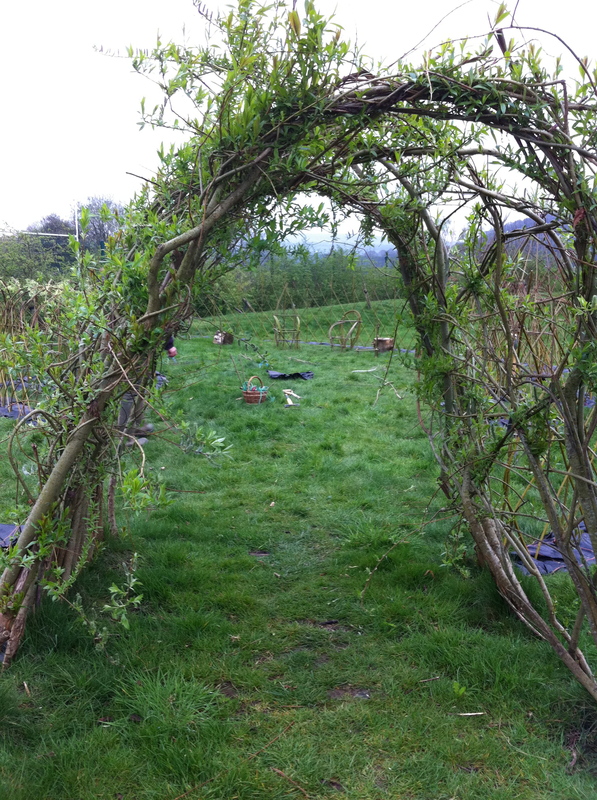 We started on Tuesday constructing a circular boundary fedge of Flanders Red Willow which joined onto the existing native hedgerow to form a secure and secluded area for play. 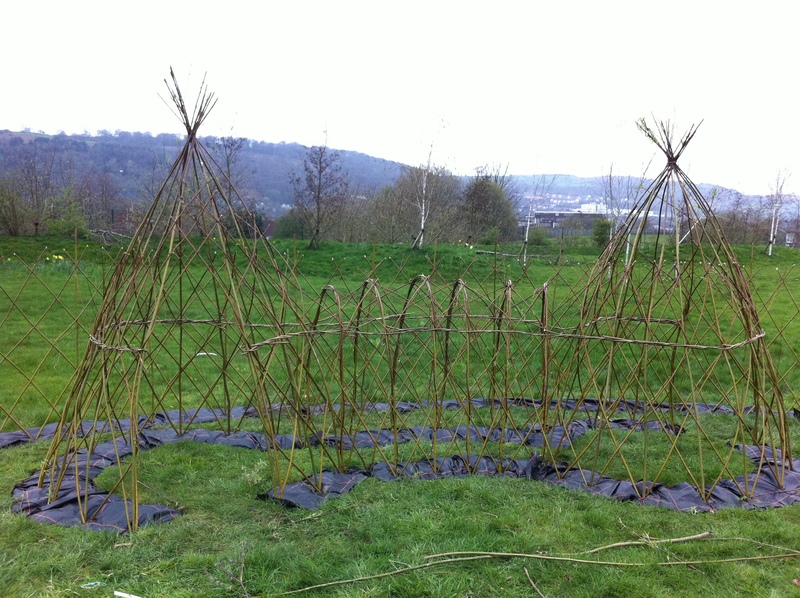 We then constructed a Fairy Castle (two wigwams and a mini tunnel), a woodcutters cottage (small dome), the 3 bears Chairs, a dragons den (lozenge shape) complete with dragon’s nest and eggs a dragons tail and head and a ‘spinney’ (circular tunnel which spins you round and gives you the chance to enter from one direction and come out of the other). 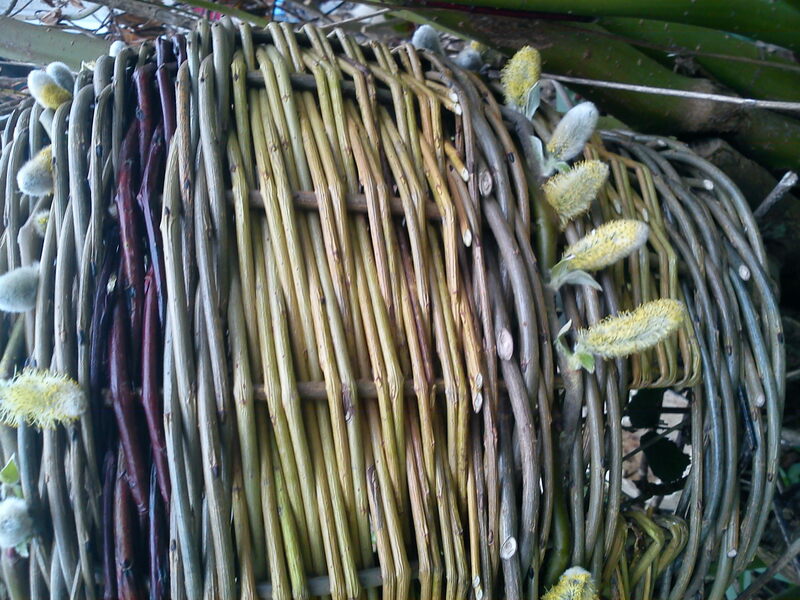 We are also going to weave a ‘tower’ for peering up and out of. 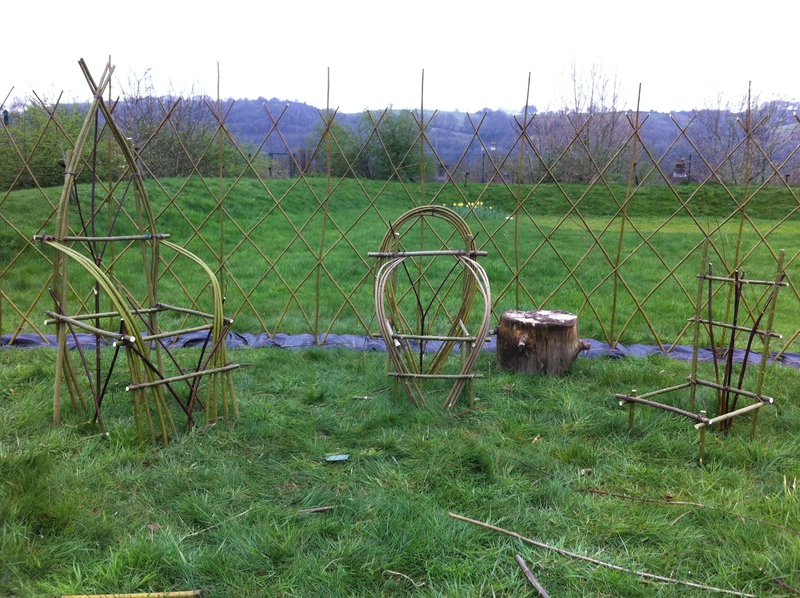 This will be solid posts arranged in a circle which will be solidley woven with a basket weave and chunky willow. 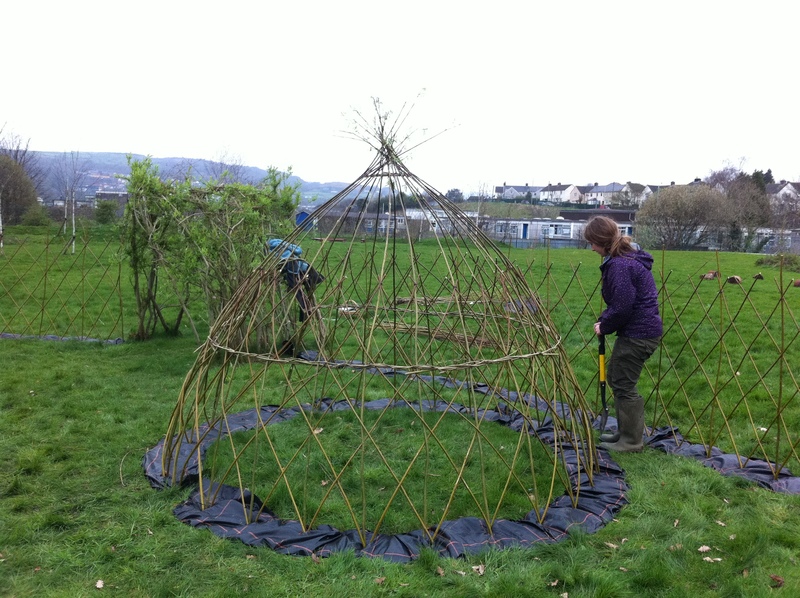 Lots still to do but the living willow is in the ground! The area is designed to stimulate imaginative play and the nursery plan to complement the village with props such as a dressing up rail, story books and artefacts such as 3 bowls and wooden spoons. 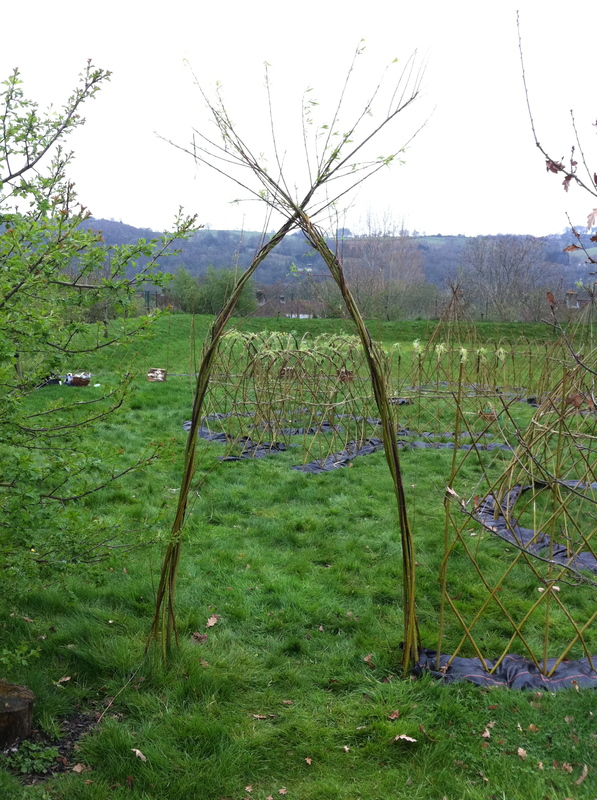 We also plan to make a selection of crowns and wands from willow. I don’t know about the children but Mel and I are just beside ourselves with excitement simply working on this project………… can’t wait to visit and see how the children play in it!